Besides Thanksgiving and December holidays, Super Bowl Sunday is one of the biggest food events of the year and it wouldn’t be a celebration without potato chips. In fact, over 28 million lbs or approximately 6.7 billion oily potato chips are consumed on game day alone. As you plan your Super Bowl party menu, consider popchips, which provide a better-for-you snack alternative to oily potato chips. In fact, if everyone switched out each of their fried potato chips with popchips on game-day, roughly 1 million gallons of oil would not be consumed. A much more healthier way to celebrate the great sport of football, don't you think? Potato popchips are available in seven delicious flavors. My personal fave are the popchips sour cream and onion variety, so delicious they don't even require a dip to go with them that add who knows how many unnecessary extra calories. What's more is that popchips contain no artificial ingredients, no trans fat, no saturated fat, no msg and are certified gluten free. Visit poppedvsfried.com to discover more #snackfacts and to learn how you can do your small part to decrease the amount of oil being consumed on game day. 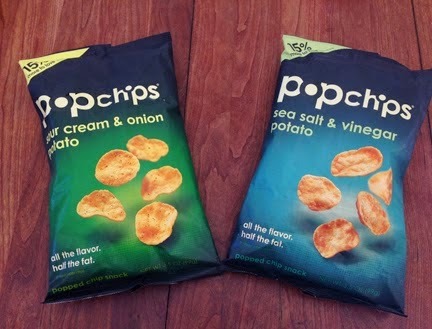 Just for visiting you'll be able to activate a coupon for $1 off the purchase of any two bags of popchips purchase.